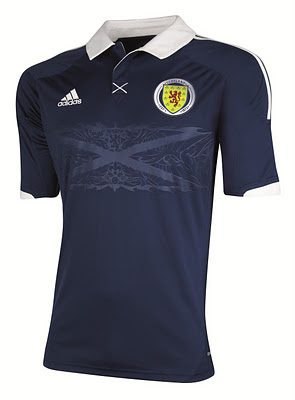 "Ya beauty, a new Scotland strip." That's me trying to channel my eight year old self because I'm not really sure why anyone who isn't going to wear it competitively or anyone over school age should get excited about such a thing. And here it is. In all it's glory. Or all it's "embarrassment to the nation-ness" depending on your point of view. A quick glance at a new bit of adidas kit and suddenly we're all Gok Wan. "This unique Saltire embossing incorporates [a] range of sources from around Scotland that champion the Scottish FA’s rich footballing history – including the old and new Hampden Park, the Lion Rampant, the Thistle, the 1928 ball used in the 5-1 demolition of England at Wembley Stadium, the Fleur De Lis and the date 1873 – the year of the Scottish FA’s foundation." It's doubtful if the artists working on the Sistine Chapel drew on so many strands of divine inspiration. "The popper-button neck vainly attempts to appropriate some retro-classic collar style but it's as futile and incongrous as grafting an imitation Rolls-Royce grille onto an Austin Princess." The badge is reassuringly round, inspired by the 1974 "oh so close" World Cup experience. Although it's actually an imitation of the circular badge used from, I think, the early 1960s until the Umbro shirts of the late 80s/early 90s. Unlike the old badge this one just says "Scotland, Est: 1873" risking the erroneous impression that the country began in 1873. And that would make Mel Gibson's grasp of history even worse. The socks feature the word "Alba," possibly to reassure that same demographic which feels a bit panicked on arriving at Linlithgow by train and not seeing a Gaelic translation of where they are on the platform signage. The Gaelic heritage of football's traditional Scottish heartlands seems a bit hazy to this observer. Basically it's a football strip. It's not salmon pink nor a horrendously ill-conceived tartan effort. Love it, like it, buy it, hate it. It will make bugger all difference to how the team play. On a personal note I think it would have been a nice touch, for both players and fans, if it had been given a debut at last night's Under-21 international. A wee boost for the young squad that would have been. But I'm no Adi Dassler. One point a staff member in JJB brought up with me is they don't know where to put the number on the front yet. He said it can't go on the embossing because it will just come off and there no room above it and below the collar. Hope it doesn't go on the belly because that will look stupid! The things you have to think about these days? I'm now intrigued to see what solution they come up with to address this problem on Friday evening.